DAPI Fluoromount-G® is a water-soluble, 4',6-diamidino-2-phenylindole (DAPI) containing compound recommended for slides mounted after a staining procedure having an aqueous final step. When bound to DNA, DAPI fluoresces and is typically used as a nuclear/chromosomal counterstain. Since DAPI Fluoromount-G® is water-soluble, the coverslip may be removed by submerging the slide in a PBS solution until the coverslip is loosened. This mounting medium also provides a semi-permanent seal for storage of slide preparations. 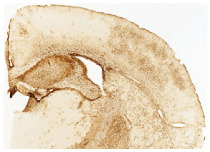 Frozen section of Pvalb-IRES-CRE mouse CA1 hippocampus injected with AAV-hM4Di-mCherry was stained with anti-parvalbumin followed by a secondary antibody and mounted with DAPI Fluoromount-G® (SB Cat. No. 0100-20). HEK293T cells transfected with p.G120C-mRFP-ICK were mounted with DAPI Fluoromount-G® (SB Cat. No. 0100-20). 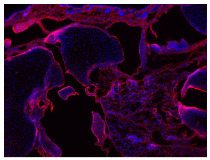 BALB/c mouse intestine sections were stained with Rat Anti-Mouse MAdCAM-1-BIOT (SB Cat. No. 1865-08) followed by Streptavidin-FITC (SB Cat. No. 7100-02). Sections were mounted with DAPI-Fluoromount-G® (SB Cat. No. 0100-20). Paraffin embedded L. erinacea embryos were stained with CM-DiI and mounted with DAPI Fluoromount-G® (SB Cat. No. 0100-20). 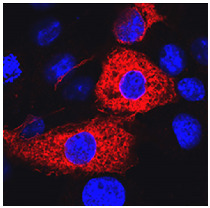 HCC827 cells were stained with anti-E-cadherin followed by a secondary antibody and mounted with DAPI Fluoromount-G® (SB Cat. No. 0100-20). Ebola infected paraffin embedded mouse lymph node tissue section was stained with AF555 conjugated anti-Ebola virus and anti-CD11b followed by an AF488 conjugated secondary antibody and mounted with DAPI Fluoromount-G® (SB Cat. No. 0100-20). 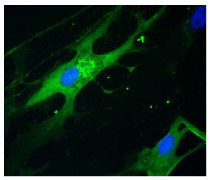 Human lung mast cells were stained with anti-TRPC6 followed by an AF488 conjugated secondary antibody and mounted with DAPI Fluoromount-G® (SB Cat. No. 0100-20). Human neutrophils grown in serum-free media and EDTA were mounted with DAPI Fluoromount-G® (SB Cat. No. 0100-20). C. pneumonia infected HEp-2 cells were stained with FITC labeled anti-chlamydia-LPS followed by Evans Blue and mounted with DAPI Fluoromount-G® (SB Cat. No. 0100-20). 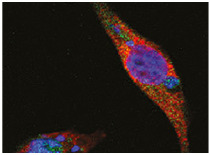 SDV infected rainbow trout satellite cells were stained with anti-E2 followed by an AF488 secondary antibody and mounted with DAPI Fluoromount-G® (SB Cat. No. 0100-20). 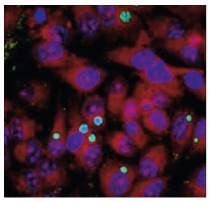 Mutated FSHR transfected COS-7 cells were stained with anti-FSH-receptor followed by an AF555 conjugated secondary antibody and mounted with DAPI Fluoromount-G® (SB Cat. No. 0100-20). 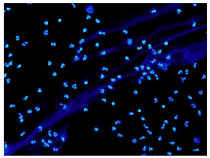 Human neutrophils grown in serum-free media were stained with anti-neutrophil elastase followed by an AF555 conjugated secondary antibody and mounted with DAPI Fluoromount-G® (SB Cat. No. 0100-20). Notch1 transfected HEK293T cells were stained with anti-O-GlcNAc and anti-Notch1 followed by AF555 and DyLight 488™ conjugated secondary antibodies and mounted with DAPI Fluoromount-G® (SB Cat. No. 0100-20). DyLight™ is a trademark of Thermo Fisher Scientific, Inc.
Human articular chrondrocytes were stained with anti-collagen II followed by an AF594 conjugated secondary antibody and mounted with DAPI Fluoromount-G® (SB Cat. No. 0100-20). 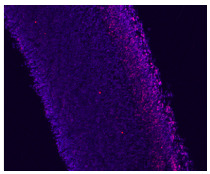 Frozen E15.5 embryonic mouse brain section was stained with anti-HMGB2 followed by a Rhodamine Red ™-X conjugated secondary antibody and mounted with DAPI Fluoromount-G® (SB Cat. No. 0100-20). Rhodamine Red™ is a trademark of Thermo Fisher Scientific, Inc.
Caco-2 cells were exposed to titanium dioxide nanoparticles, stained with AF633 conjugated phalloidin, and mounted with DAPI Fluoromount-G® (SB Cat. No. 0100-20). 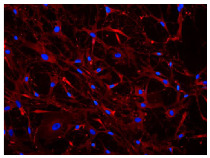 Paraffin embedded mouse left ventricular section post myocardial infarction and intravenous injection with DiI-labeled macrophages was mounted with DAPI Fluoromount-G® (SB Cat. No. 0100-20). 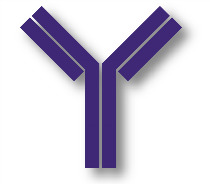 Human cancer-associated fibroblasts 120 h post exposure to 18 Gy were stained with anti-vinculin followed by an AF488 conjugated secondary antibody and mounted with DAPI Fluoromount-G® (SB Cat. No. 0100-20). Fluoromount-G® is a registered trademark of Southern Biotechnology Associates, Inc.
CellTracker™, ER-Tracker™, and Rhodamine Red™ are trademarks of Thermo Fisher Scientific, Inc. and its subsidiaries. Duolink® is a registered trademark of Sigma-Aldrich International GmbH. Lissamine™ is a trademark of Imperial Chemical Industries, Inc.
Fluoro-Jade® is a registered trademark of Histo-Chem, Inc.
Chromeo™ is a trademark of Active Motif.